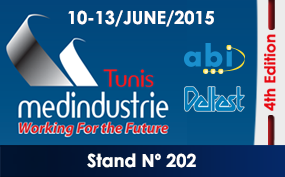 ABI Electronics will be represented at Tunis-medindustrie 2015, Parc des Expositions du Kram, Tunisia - 10-13 June - Stand 202. The Chamber of Commerce and Industry of Tunis is organizing the 4th edition of the International Exhibition of Industrial Partnership and Innovation "Tunis-Medindustrie 2015" under the slogan "Working for the Future". For a chance to discover ABI's products and to discuss your requirements with our partner DELTEST, please visit us at Stand 202.